With the rapid advancement of genome sequencing technology, researchers have dramatically increased the number of genomes that have been completely sequenced in the last few years. This genomic information has vastly increased our knowledge of living organisms. Recently, researchers reported the complete genome sequence of gorillas (Scally, et al., 2012). What did they learn from this work? By comparing the already available human and chimpanzee sequences, the researchers concluded that 70% of the human and chimp genomes are more similar to each other than to the gorilla (Scally, et al.). However, 15% of the gorilla sequence was more similar to the human sequence than the chimpanzee sequence, and the remaining 15% of the gorilla sequence was closer to the chimpanzee sequence than the human sequence (Flatow, 2012; Smith, 2012). 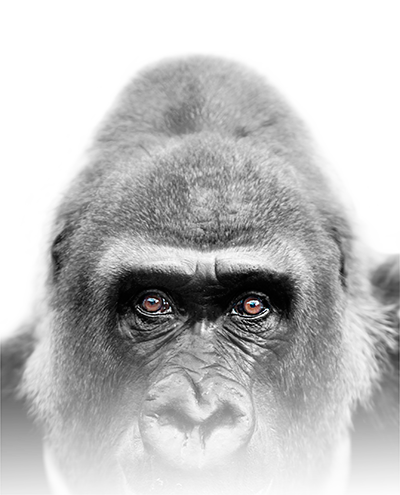 Based upon the prevailing view of the evolutionary “tree,” the 15% higher similarity between humans and gorillas would not be predicted since humans would have more recently broken off from our supposed chimpanzee relatives. Thus, the DNA sequence would reasonably be expected to reflect this relationship. In order to explain the anomalies among chimp, gorilla, and human DNA, the concept of “incomplete lineage sorting” has been employed (Scally, et al.). According to this concept, interbreeding between early chimps, gorillas, and humans continued to occur for some time after the initial “split.” The interpretation is that different regions of the genomes reflect varying degrees of relatedness to the evolutionary “relatives” resulting from the interbreeding. This finding is not an isolated incident. A 2007 study found that 23% of the human genome shares “no immediate genetic ancestry with our closest living relative, the chimpanzee” (Ebersberger, Galgoczy, et al., 2007). To boil these results down, researchers have found that some DNA sequences in humans, chimps, and gorillas are very similar, while other regions are not. In essence, some of the DNA could be interpreted to suggest relationship, while other parts do not support—and even contradict—these alleged relationships. A much simpler interpretation of DNA sequence similarities between various living organisms would be that humans, gorillas, and chimps are not evolutionarily related at all, and that common sequences represent common design features that were implemented by God for various creatures that share common biological processes, environments, and anatomy. Sequence similarities across species, then, reflect the preservation of key regions of DNA over time because of the essential functions encoded by these regions rather than evolutionary relationship. In fact, this concept can be used to identify potential functions for unexplored or poorly understood regions of various genomes by comparison with regions of known function in other organisms [NOTE: for a review of recently identified DNA functions, see Shapiro and von Sternberg, 2005 and Wells, 2011]. In this discussion, it is essential to recognize the difference between the facts and the interpretations placed on those facts. Interestingly, there has been a slowly growing discontent regarding the concept of a universal tree of life, which is used to catalog evolutionary relationships. While still firmly holding to evolution, some scientists have suggested what would amount to a major overhaul of the concept, including some evolutionists who hold that there was not a single common ancestor of all life (Bapteste, Susko, et al., 2005; Doolittle, 2009; McInerney, Pisani, et al., 2011). While evolutionists continue to debate their interpretations of the facts, it will be interesting to watch for the next genomic breakthrough as God’s Word continues to be upheld by the evidence. Bapteste, E., E. Susko, et al. (2005), “Do Orthologous Gene Phylogenies Really Support Tree-Thinking?” BMCEvolutionary Biology, 5:33. Cohen, J. (2007), “Evolutionary Biology. Relative Differences: The Myth of 1%,” Science, 316:1836. Doolittle, W.F. (2009), “The Practice of Classification and the Theory of Evolution, and What the Demise of Charles Darwin’s Tree of Life Hypothesis Means for Both of Them,” Philosophical Transactions of the Royal Society B: Biological Sciences, 364:2221-2228. Ebersberger, I., P. Galgoczy, et al. (2007), “Mapping Human Genetic Ancestry,” Molecular Biology and Evolution, 24:2266-2276. Flatow, I. (2012), “Gorilla Genome Sheds Light On Human Evolution,” Science Friday, http://www.npr.org/2012/03/09/148306985/gorilla-genome-sheds-light-on-human-evolution. McInerney, J.O., D. Pisani, et al. (2011), “The Public Goods Hypothesis for the Evolution of Life on Earth,” Biology Direct, 6:41. Scally, A., J.Y. Dutheil, et al. (2012), “Insights into Hominid Evolution from the Gorilla Genome Sequence,” Nature, 483:169-175. Shapiro, J.A. and R. von Sternberg (2005), “Why Repetitive DNA is Essential to Genome Function,” Biological Reviews of the Cambridge Philosophical Society, 80:227-250. Smith, K. (2012), “Gorilla Joins the Genome Club,” Nature News, http://www.nature.com/news/gorilla-joins-the-genome-club-1.10185. Wells, J. (2011), The Myth of Junk DNA (Seattle, WA: Discovery Institute Press).